Starting today through August 26th, Disney Junior is hosting an interactive treasure hunt online and during your preschooler's favorite television programs. 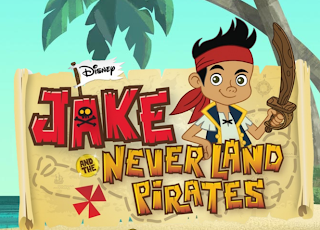 In keeping with the theme of the #1 hit show Jake and the Never Land Pirates, gold doubloons will pop up onscreen during Disney Junior programming. Viewers can enter their tally online at http://www.DisneyJunior.com/Summer to unlock interactive treasures like new episode previews, games and activities. There are also gold doubloons you can download and decorate. Upload photographs of your kids with their decorated doubloons for a chance to be featured on-air during their favorite shows! In accordance to the FTC Guidelines and WOMMA Code of Ethics, I am disclosing that I have received complimentary merchandise from Disney Junior. I'm a fan of the Mouse and all of his empire and probably would have told you, anyway. Just so you know.